What do change managers and consultants complain about the most? The lack of support from leaders. Lack of leadership support is consistently at the top of Prosci’s list of reasons why organizational change fails (Prosci is the world’s largest provider of change management training based on a proprietary model). 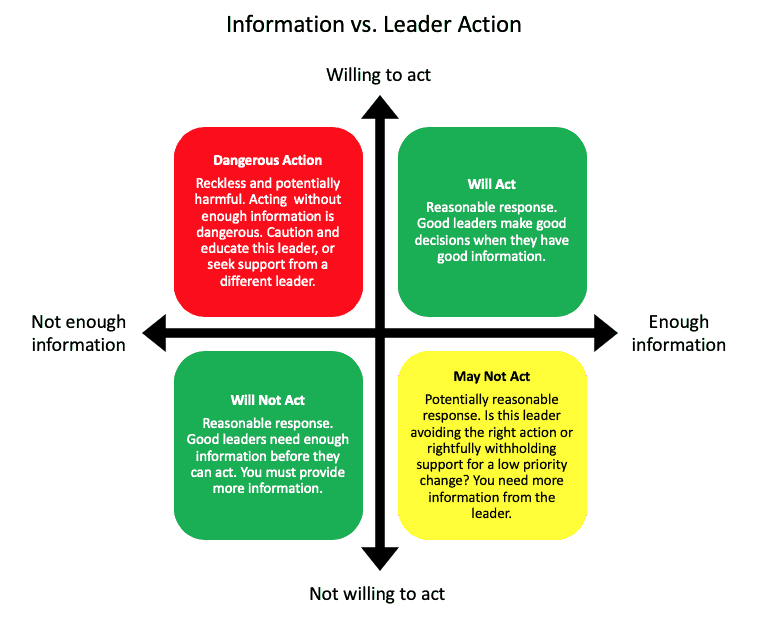 The solution to a lack of support for change can be found in the relationship between a leader’s willingness to act and her need for information. When I was asked about this last week, I turned to the whiteboard and drew the diagram below. When we want support for change, we often need a leader to do something. Many of the most popular change management models include the need for leaders to model desired behaviors and communicate the value of the change. So, support is active—leaders must talk, and then walk-the-talk. Like it or not, support for organizational change needs to be earned. Support is earned by engaging with leaders and providing adequate information. If leaders have been around long enough, they have experienced the disruption caused by acting on inadequate information. If your leader isn’t supporting your change, then maybe you haven’t convinced them that they should. This leader needs to know more about your change. But, what if you’ve provided all the information you can, and the leader still won’t act? One of two things are happening. One possibility is that your change should get support, but your leader just doesn’t care. This is unlikely, since we can assume that your leader wants the organization to benefit from the change. It’s unlikely that she is avoiding doing the right thing. So, what else could be happening? Things change and there may now be more important priorities than the change you’ve been asked to implement. You need to ask about competing priorities. You may also need to carry on with less active support from that busy leader. In the end, you can always ask them if you can schedule your change to a time when it will be a priority. Asking that question might get the support you need. What’s worse than no support? Leaders who act without enough information. Their recklessness will sabotage organizational support for your change. Hasty and ill-considered messages from the top disengage everyone. Integral to one of the most comprehensive and flexible change management models is the concept of conscious change leadership. The creators of the Change Leader’s Roadmap define this as thriving in complexity, engaging others and valuing the methodologies necessary to implement successful organizational change. These are the good decisions and actions you get when good leaders have good information. Leadership support will make or break our change efforts. How have you been able to get support? Let me know on LinkedIn and Twitter. You can also go to WorkFeelsGood.com and subscribe for more articles like this one.